This modern, light filled townhouse is stylish and sophisticated. It has everything needed for a relaxing stay, including a great book collection; 2 spacious north facing balconies with quality outdoor furniture; quality bedding and linen; an impressive entertainers kitchen; individual split systems in each of the 3 bedrooms and a private jetty with boat mooring. The property has loads of parking, with a double garage to lock away the boat, and room for 2 cars in the driveway. Guests are welcome to use the bikes (and helmets) and local cycling maps are provided. After skiing all day, guests can relax in the Cypress Drive affinity swimming pool. 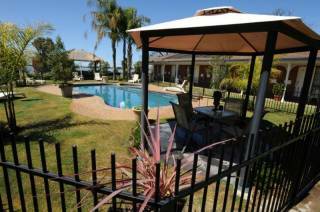 The location is perfect for families – only a short distance to the ‘Tunz-a-Fun’ mini golf and amusement park, the Yarrawonga foreshore, water slides and the Mulwala Water Ski Club. Our in-house chef can deliver a beautiful, private dinner party; cater for a cocktail party or prepare a hearty cooked breakfast. Cypress Drive is just 45 minutes from the famous Rutherglen wine region and a bus and driver can be arrange upon request.